Because of the fog I went to the Rhine valley again. I checked the wind speeds in advance. And I just started where I escaped to the Appenzell the last time. I took the first train to Montlingen. Thanks to the world famous public transportation in Switzerland you can reach even the most remote town with ease. There are ticket machines that will sell you a ticket to everywhere from all over. I am definitively spoiled. However, as I reach Sargans I am shocked. There is snow. A lot of snow. I know that in the Rhine valley there is special warm wind. The so called foehn. I soon stop and tape my feet: My toe joints get a special band aid on both sides. That keeps the pain manageable the entire day. And there is fog for the first for hours. Thick fog, cold fog. And no toilets or privies. Just abandoned border stations. So, I must poop in a small forest. The soil is frozen; I use this as an excuse to not dig a cat hole. I cover with leaves. Turns out, that I did my business just some yards away from the border to Liechtenstein. 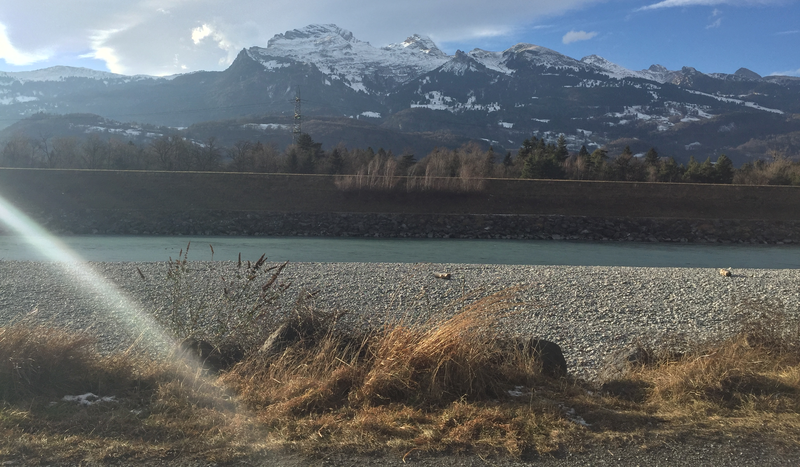 I cross into Liechtenstein and follow the Rhine. It gets boring because the Rhine is a giant canal. There is just the river and dams on both sides. In my lunch break, at least the sun cuts through the fog. I change to my shades and walk until darkness with them. Some serious mountains come into view. Liechtenstein is a tax haven and a constitutional monarchy. Autonomous activists once called for a worker’s day demonstration in Liechtenstein instead of Zurich. The police even thought about mobilizing the Swiss army (Liechtenstein itself has no army). Of course, no one showed up in Liechtenstein. I pass the castle of the monarch of Liechtenstein. The wind hits me at 2pm. I had the feeling of being faster than on the river Sihl, my GPS data says otherwise: 3.1 miles per hour when moving. I get rid of my down jacket in the afternoon but I had to struggle against the wind. I pass the Rotex company. The use an interesting helicopter and I just get a glimpse of one of them. I also pass an industrial plant where somebody is cleaning a truck with a crane. On the crane the name Palfinger stands out. It’s the company that delivered the fast rescue crafts for MOAS. 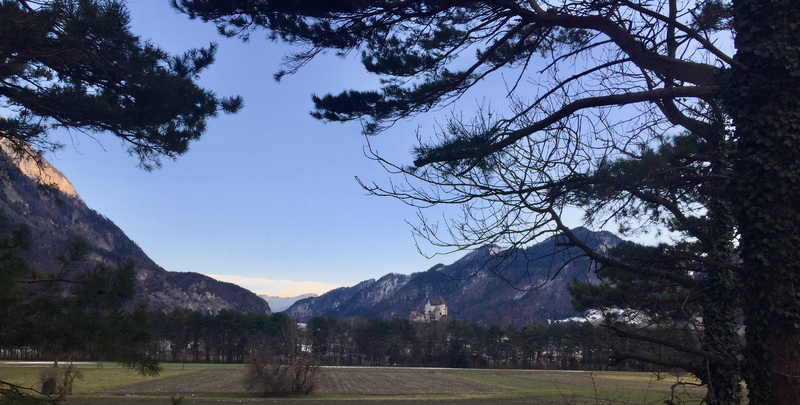 Also, I pass the castle of Balzers. 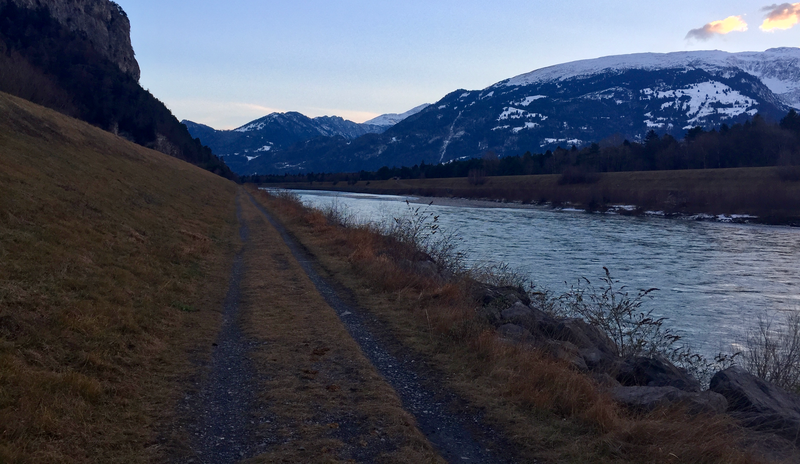 Soon enough I discover that I made a navigation error: I thought about walking back to Sargans but to do so, I would have to walk back 3 miles on the Rhine or ford the Rhine. No options. So, I keep walking towards the town of Fläsch. There is a huge rock wall. And because we are near the border, of course there is also a huge fortress. It is now in private hands and the owners still claim that it would have some importance for the defense of Switzerland. The thing is: It was obsolete before they started to build it in 1940. The Germans would not have raised one eyebrow because of some canons in a mountain. However, the Fortress was in use until 1985. Soon after the second world war it was even extended, the new enemies were the communists. Because of the climate in the valley there is vine. I can only guess the extends of the fields because it’s dark now. From Fläsch it is 40 minutes to either Maienfeld or Bad Ragaz. I decide to go to Maienfeld. My grandfahter used to live there as a child before he went to the Italian part of Switzerland. Once in the train I get rid of my shoes quickly. However, no new blisters. Notable Accomplishments: Pain management worked. Survived the wind. Stayed focused even as the landscape got boring.